Signing & Talk with Chuck Wendig "The Cormorant"
Saturday, February 15th 2:00 PM Please join us for a discussion & book signing with author Chuck Wendig which will feature his newest book The Cormorant. Miriam is on the road again, having transitioned from "thief" to "killer". Hired by a wealthy businessman, she heads down to Florida to practice the one thing she's good at, but in her vision she sees him die by another's hand and on the wall written in blood is a message just for Miriam. She's expected... About the Author Chuck Wendig is equal parts novelist, screenwriter, and game designer - A.K.A. an all-around "freelance penmonkey." You can probably find him on the side of a highway holding a sign, "Will Write For Booze." He currently lives in the wilds of Pennsyltucky with wife, dog, and infant heir to the Wendig throne. You can find him dispensing dubious writing advice at his blog, terribleminds.com. Chuck was nominated for the 2013 John W. Campbell Award for Best New Writer. Blog: www.terribleminds.com Twitter: twitter.com/chuckwendig All of our in-store events are free and open to the public (unless otherwise noted). There is parking available in the lot behind the store and in the surrounding neighborhood.Click here for parking information http://www.doylestownborough.net/visitors/parking. If you can't come to an event and still want an autographed copy of the book, you may purchase titles in advance either in the store, over the phone (215.230.7610), or through our website. Mystery Book Group - "Mockingbird"
Join our Mystery Book Group for a lively discussion beginning at 7:00 p.m. on Wednesday, January 23. All community members are welcome! This month we will be reading and discussing Mockingbird. Book Group selections are available at Books & Co. for 15% off the list price. Unless otherwise noted, we meet on the 4th Wednesday of each month at Books & Company. Had enough of the rat race? Has your boss been tightening the screws? Well then, it’s time to let your hair down, put your feet up, and knock back a gin or two. Hightail it down to the Mandrake Bar for an evening of noir with some of the best ink-slingers froim all over the genre has to offer. Join Chuck Wendig, Johnny Shaw, Owen Laukkanen, Greg Bardsley, Eric Beetner, and Katherine Tomlinson. Oh, and there’s booze, so keep the babes in their cribs, this event is 21 and over. Four authors celebrate their respective new releases from Angry Robot Books, a UK-based science-fiction and fantasy imprint: Adam Christopher (Seven Wonders), Chuck Wendig (Mockingbird), Gwenda Bond (Blackwood), and Kim Curran (Shift). Chuck Wendig will be here to sign copies of his latest fantasy/horror novel Blackbirds. About the Author Chuck Wendig is equal parts novelist, screenwriter, and game designer. He is the author of the novels DOUBLE DEAD, Blackbirds, and MOCKINGBIRD. In addition, he's got a metric boatload of writing-related e-books available, including the popular 500 WAYS TO BE A BETTER WRITER. He currently lives in the wilds of Pennsyltucky with wife, dog, and newborn progeny. 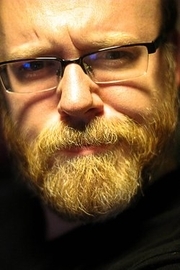 Chuck Wendig has described himself as equal parts novelist, screenwriter and game designer. In the course of his career, Wendig has contributed over two million words to the game industry, including “Hunter: The Vigil.” With gamer-cred like that, it’s no wonder Blackbirds, Wendig’s second novel, is a tense and action packed terror ride. When we offered to release 100 Blackbirds in honor of the launch of Blackbirds, Wendig reminded us of the mess that could accompany a spectacle such as that …we thank him. Chuck Wendig is a novelist, a screenwriter, and a freelance penmonkey. He's written too much. He should probably stop. Give him a wide berth, as he might be drunk and untrustworthy. He currently lives in the wilds of Pennsyltucky with a wonderful wife and two very stupid dogs. He is represented by Stacia Decker of the Donald Maass Literary Agency. Chuck Wendig is currently considered a "single author." If one or more works are by a distinct, homonymous authors, go ahead and split the author. Chuck Wendig is composed of 3 names. You can examine and separate out names.